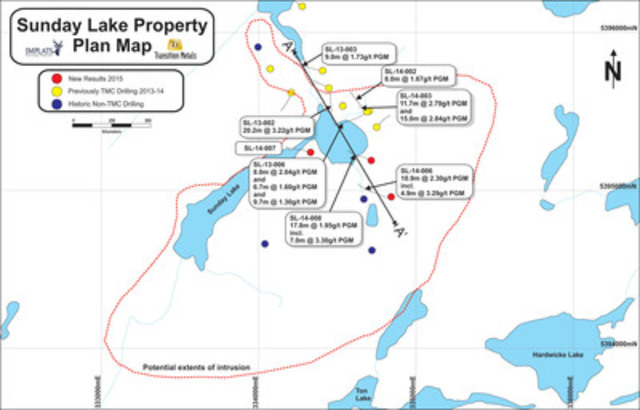 SUDBURY, ON, Jan. 26, 2015 /CNW/ - Transition Metals Corp (XTM – TSX.V) ("Transition", "the Company"), is pleased to announce assay results from the latest program of diamond drilling at Sunday Lake, located 25 km north of Thunder Bay, Ontario. The program, a Joint Venture owned 75% by Impala Platinum Holdings limited (Implats) and 25% by Transition and funded by Implats, was initiated in the fall of 2014 and consisted of 3 holes totaling 2,074 metres to further evaluate the extent and quality of the Discovery Zone (see news release dated January 27, 2014). The results confirm continuity of PGM mineralization over an area approximately 700 metres long and 300 metres wide at depths tested between 370 to 800 metres below surface. The mineralization remains open for further expansion in all directions with some of the best grade thickness intercepts remaining open at relatively shallow depths to the east and to the west (refer to map showing boreholes and intercepts). Intersections represent close to true thickness of mineralized zone. 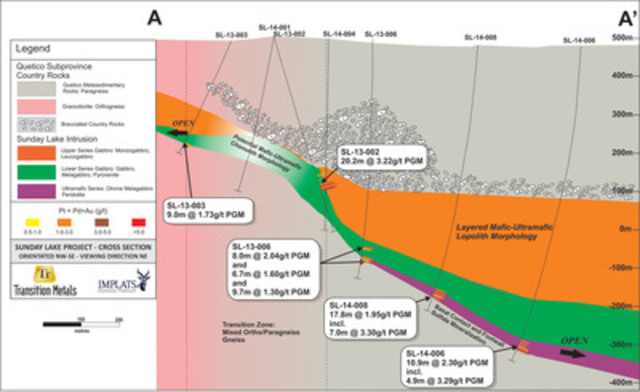 Figures 1 and 2 present a plan map of drilling and an interpreted geological cross section. If you are having difficulties viewing the figures please visit the Sunday Lake project section at www.transitionmetalscorp.com or use the following link: http://www.transitionmetalscorp.com/images/stories/News/Sunday_Lake_Discovery.pdf to download the pdf version of this release. Commenting on the latest results, CEO Scott McLean stated "We clearly have identified a mineralized system with encouraging grade and large size potential. To date, less than 10% of the highly prospective SLI has been tested with diamond drilling. Additional drilling is warranted to further evaluate the economic potential of this new discovery." SL-14-006 (863m: 270/-85°): The hole intersected 421.9m of the Sunday Lake Intrusion (SLI) from 414m. From 806.4-835.9m pyrrhotite and chalcopyrite mineralized ultramafic and gabbroic rock along and above the basal contact were encountered, returning 10.9m of 2.3 g/t PGMs between 825-835.9m. Within this unit a higher grade zone returned values of 3.29 g/t PGMs over 4.9m from 831-835.9m. SL-14-007 (497m: 295°/-78°): The hole intersected 90.6m of the SLI from 355.5-446.1m. No significant assays were reported. SL-14-008 (714m: 290°/-85°): The hole intersected 284.9m of the SLI from 393.9-678.8m. From 655.6-678.8m pyrrhotite and chalcopyrite mineralized ultramafic and gabbroic rocks along the basal contact were encountered returning 17.8m of 1.95 g/t PGM's. Within this unit a higher grade zone returned values of 3.30 g/t PGM's over 7.0m from 656.6-663.6m and 6.60 g/t PGM's over 1m from 661.6m. Polished specimens of Sunday Lake drill core and a poster will be displayed by company representatives in the AMEBC Core Shack venue at the Vancouver Convention Center this week on Wednesday January 28th and Thursday January 29th, 2014. The Company congratulates company co-founder and industry mentor, David Elliott on his receipt of the prestigious Murray Pezim Award by Association for Mineral Exploration British Columbia (AMEBC) for perseverance and success in financing mineral exploration. David has made a significant contribution to the mining industry over his 40–plus year career by financing hundreds of mineral exploration and development companies both public and private and has been a key contributor to the development of Transition Metals. To date, less than 10% of the highly prospective SLI has been tested with diamond drilling. Drilling has, however highlighted the excellent potential of the intrusion to host a significant PGM resource. Further drilling is required to expand the known mineralized zone and realize the intrusion's economic potential. The Sunday Lake PGM-Cu-Ni discovery is located approximately 25 km north of Thunder Bay and 25 km west of Panoramic's Thunder Bay North Ni-Cu-PGM deposit. The property covers a 3.5 km diameter circular reversely-polarized magnetic anomaly associated with a large buried mafic-ultramafic intrusion interpreted to be Proterozoic in age and related to the Midcontinental Rift (MCR). In January of 2014 the company announced that it had intersected 20.2 metres grading 3.22 g/t combined PGMs. In June the company reported assay results from a 15 metre interval containing 2.84 g/t PGMs as well as a 5.0 metre interval averaging 5.0 g/t PGM's that included a 1 metre interval containing 9.75 g/t PGMs. Drilling on the project continues to expand and define new zones of high platinum tenor mineralization with funding for the project being solely provided by Implats towards the completion of a Feasibility Study. In April of 2014, Transition and Implats were awarded the Bernie Schneiders Discovery of the Year Award in recognition for this discovery. The technical elements of this press release have been reviewed and approved by Mr. Grant Mourre, P.Geo. (APGO), a Qualified Person under National Instrument 43-101. All samples were analyzed in Vancouver by ALS Chemex. Platinum, palladium and gold values were determined together using standard lead oxide collection fire assay and ICP-AES finish. Base metal values were determined using lithium metaborate fusion and ICP-MS. A Certified Reference Material (CRM) standard, blank or duplicate is inserted on every 10th sample in the following order: CRM, blank, CRM, duplicate. The cycle repeats every 40 samples, thus ensuring that 10% of samples submitted are control samples. Laboratory checks are also done with one sample in every batch (max 40 samples) being submitted to an external lab for comparison. Transition Metals Corp (XTM -TSX.V) is a Canadian-based, multi-commodity project generator that specializes in converting new exploration ideas into Canadian discoveries. The award-winning team of geoscientists has extensive exploration experience in established, emerging and historic mining camps, and actively develops and tests new ideas for discovering mineralization in places that others have not looked, which often allows the company to acquire properties inexpensively. The team is rigorous in its fieldwork, and combines traditional techniques with newer ones to help unearth compelling prospects and drill targets. Transition uses the project generator business model to acquire and advance multiple exploration projects simultaneously, thereby maximizing shareholder exposure to discovery and capital gain. Joint venture partners earn an interest in the projects by funding a portion of higher-risk drilling and exploration, allowing Transition to conserve capital and minimize shareholder's equity dilution. The company, which went public in 2011, has an expanding portfolio that currently includes 30 gold, copper, nickel and platinum projects primarily in Ontario, Nunavut and Saskatchewan.